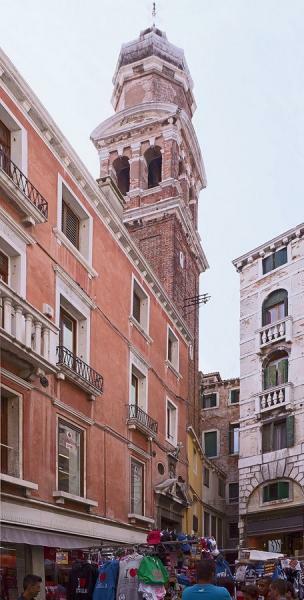 The church of San Bartolomeo is, like Santa Sofia one of Venice's peekaboo churches, engulfed by other buildings and even turning its back on its campo, with its entrance around the corner. This was formerly the German church in Venice (the Fondaco dei Tedeschi is nearby) but few of its old parishioners would recognize it since the pedestrian rebuilding of 1723. In 1506, Dürer painted the Madonna of the Rosary for the church, a painting inspired by Giovanni Bellini (and which is now in the Národni Gallery in Prague). It was famous for Sebastiano del Piombo’s Organ Shutters, which once went off to the Accademia for restoration and never returned. Don’t miss the funny face, sticking its tongue out at you from the foot of the campanile. It’s a good job Ruskin didn’t see this one. Today the church is mostly used for concerts, although check the San Salvador website for the chance of a guided tour.